Have you been thinking about a brushless gimbal for your Multi-Rotor to feed your cinematographer, inner child? Don’t get suckered into buying a sub-par overpriced kit. Do the math and look at the value of these ready to go Quantum brushless gimbal motors. This FlyCat 2805 motor comes with flush mounting so any DIY to PRO projects are simple and straightforward. It’s a perfect match to our Brushless Gimbal Stabilization Board and IMU. The 2805 140KV Brushless Gimbal Motor is pre-wound for optimal torque and smoothness. Available in two sizes, picked for the two most common class cameras. 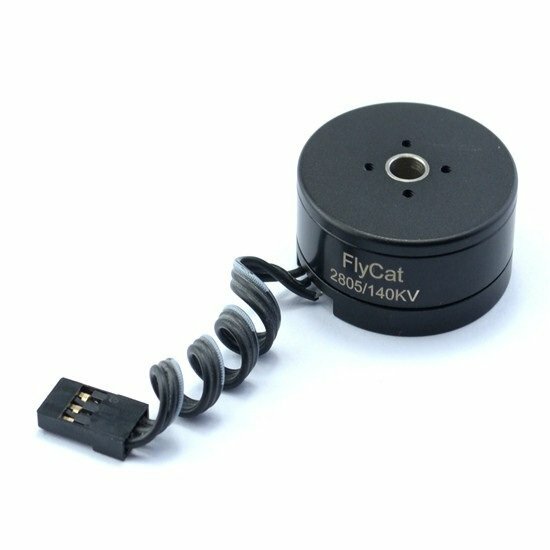 The 2805 140KV Brushless Gimbal Motor comes with a servo style connector making it easy to connect with gimbal controllers. As the gimbal motor has to survive too much drags in its operational life hence it equips flexible cable for nice and efficient balancing. In total, this wire and connector assembly is a Plug-N-Play system. Build your gimbal right at the first time, with this high power to weight ratio Brushless 2805 140KV Gimbal Motor and take your setup to the next level with Quantum Quality. The 2805 140KV Gimbal Brushless Motor is the perfect size for a GoPro class cameras (100-300g). It has superb Fit and Finishes. It is engineered to have a lean profile for easy integration into your set-up. 2805 140KV Gimbal Brushless Motor has preloaded bearings for the slop-free precision mount. Looking to make your video platform ultra-smooth? or Whatever your use is, if it needs to be stabilized then this 2805 140KV Gimbal Brushless Motor is up to the task.